Become part of the team! Your sponsorship will go directly to your dog as they train throughout the race season! 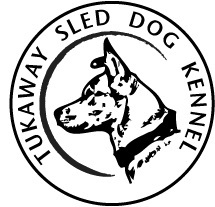 Your donation will help cover the cost of feed, supplements, vaccines, harnesses, booties, etc.. By sponsoring a dog you will join team Tukaway and receive a Tukaway T-shirt, and all the race tags earned by your dog! Click below to pick your canine athlete you want to sponsor!